Billing yourself as a boutique manufacturer of motorcycle art invites intense scrutiny and whether fair or unfair, a cosmetic blemish or performance shortcoming when found is profoundly magnified. It’s the cross MV Agusta must bear, along with its tumultuous history of financial liquidity as well as its family history of adopted ownerships. Regardless the burden, MV remains relevant by ceaselessly pushing the boundaries of motorcycle design by offering enthusiasts something more than a two-wheel commodity. A 2018 example of MV’s commitment to bettering its stable of show horses is the revised Brutale 800 RR. 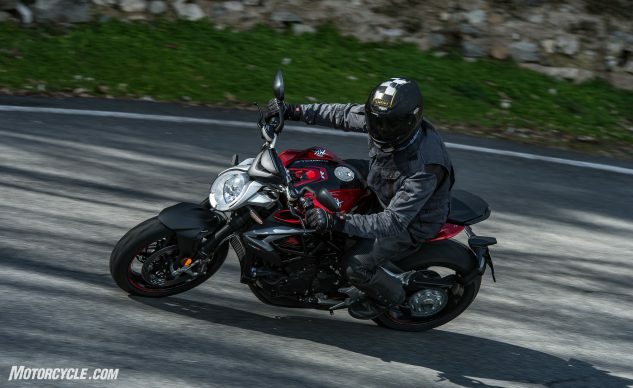 While not every reason the old model Brutale 800 lost to the new-for-2017 Triumph 765 Street Triple RS in our 800cc Euro Triples Streetfighter Faceoff has been addressed by MV engineers at the factory in Varese, the litany of updates do mandate another shootout be commissioned (hint, hint MO staffers). 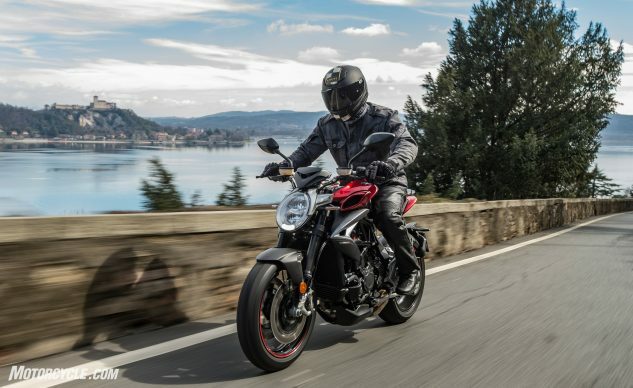 A continuing gripe since the bike’s 2013 introduction has been the throttle response of its ride-by-wire system, an imperfection that felt digital at the twistgrip and was especially aggravating at urban speeds where mere road imperfections created a herky-jerky nature that made smooth, consistent throttle application an impossibility. 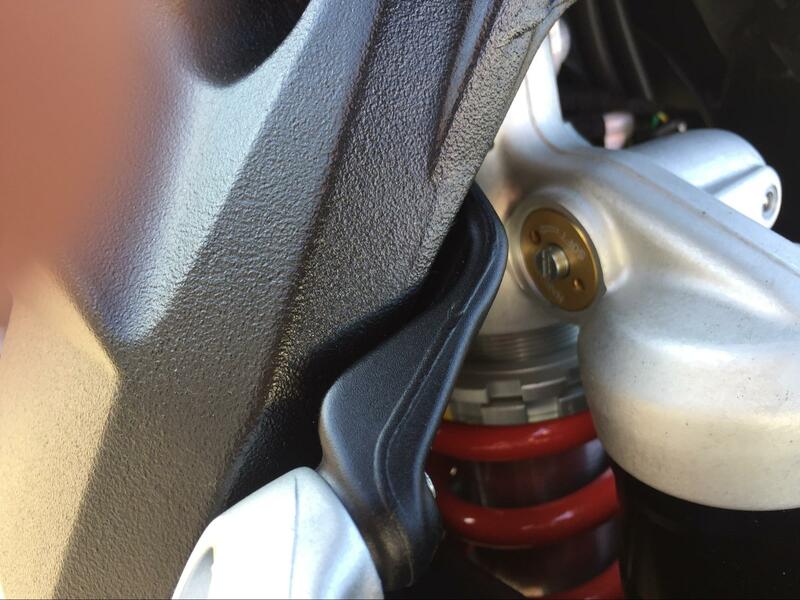 MV solved this problem by implementing a new throttle return spring and tweaking the Brutale’s MVICS system’s algorithms for improved throttle sensitivity. Our day aboard the Brutale proved their efforts fruitful, as throttle response was as natural as an old timey cable operated system manipulating a bank of well-tuned carburetors. Triumph’s 765 Street Triple (right) came out with color TFT instrumentation for 2017 while the Speed Triple followed in 2018. Compared to the Brutale’s black and white LCD screen the MV’s instrumentation certainly doesn’t seem very artful. Another improvement of the Brutale is its redesigned gearbox and shift lever system. Selecting any one of its six gears is a buttery smooth operation but only realized while in stop-and-go traffic because anything above 30 mph outside of town you’ll be using the new up/down auto-blipping quickshifter to select gears. Although our ride offered limited opportunity to seriously hustle the Brutale through a winding set of lakeside curves, the quickshifter system proved itself on par with the likes of the Speed Triple we recently tested. For track day enthusiasts the quickshifter will certainly help lower lap times. The Brutale’s handling characteristics remain as sharp as ever. For 2018 the RR model comes equipped with a steering damper to help quell any front end nervousness. Mounted above the top triple clamp, the damper features a twist knob for easy adjustment on the fly. 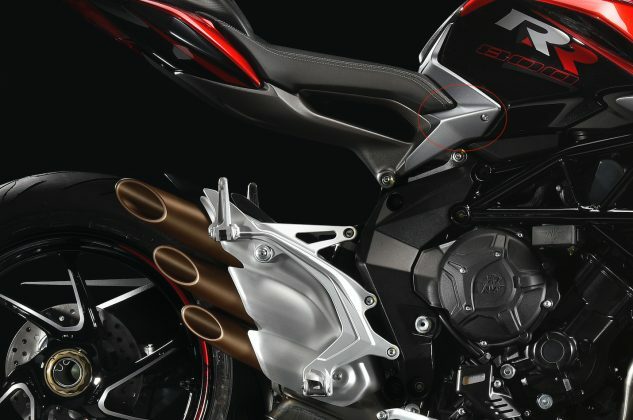 A more aggressive street ride, or especially a track session, would have helped shed light on any irregularities, so for now we’ll have to abide by our previous proclamations that the Brutale will impress any rider with its agility and eagerness to turn into a corner. Helping the Brutale maintain its reputation as a premium corner carver is its boast of a counter-rotating crankshaft which negates gyroscopic forces. The CRC steering damper is an upgrade over the base model Brutale. The RR model also boasts more horsepower, 140 hp @ 13,100 rpm vs 110 hp @ 11,500, as well as more torque with the RR claiming 63 lb-ft @ 10,100 rpm vs 61 lb-ft @ 7,600 rpm of the standard model. Front end braking power and feedback isn’t lacking for anything, at least within the speeds and environment we were testing. Having said that, the curious combination of Nissin master cylinder mated to Brembo calipers should be noted. If blind testing were possible, I’d never have suspected the mismatched combination existed on the Brutale. However, with knowledge comes complaining, and the fact that the premier Brutale isn’t fitted with Brembo’s premier M50 calipers, especially at this price point (Street Triple RS is and for less money), is a glaring point of contention, not to mention a loss of bragging rights. Spring rates on the Brutale’s Marzocchi fork and Sachs shock are stiff for casual street riding, meaning you’ll definitely feel road imperfections, but they seem to do a good job absorbing those same imperfections as speeds start climbing. As with the brake components, the Brutale’s suspension may perform adequately, but when it comes to the preeminent name in suspension, Öhlins is what comes to mind (2018 Speed Triple RS wears fully adjustable Öhlins 43mm NIX30 fork and fully adjustable Öhlins TTX36 shock). The Sachs shock is of the fully adjustable variety, but MV doesn’t make adjustments easy by hiding the screwdriver adjustment knob behind a frame spar. The inverted 43mm Marzocchi fork is also fully adjustable. An area where MV failed to make any improvements is with the footpegs. 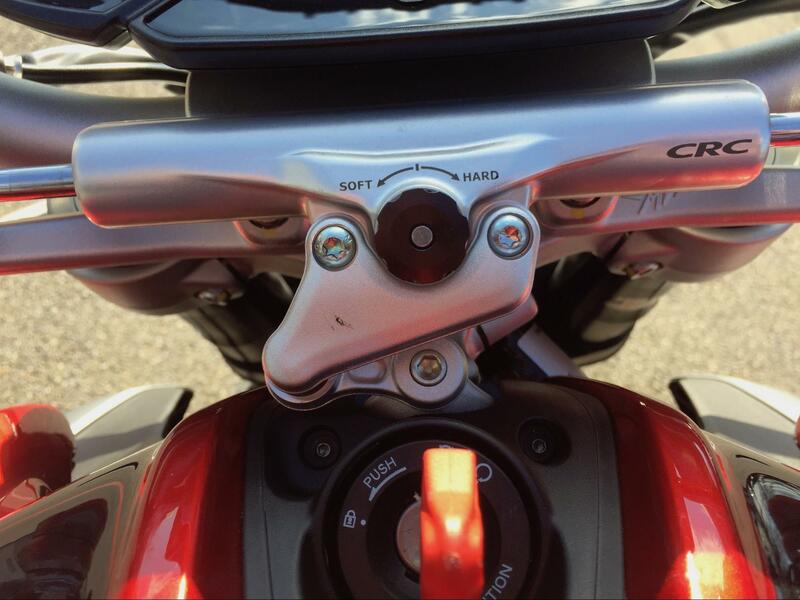 Utilizing a large one-piece bracket for both rider and passenger footpegs that must allow for stylish but in-the-way exhaust system on the right side and shift linkage placed inside the bracket on the left side dictates a wide feeling between your feet. This is exacerbated when on the balls of your feet and having your ankles forced out even wider due again to the bracket’s one-piece design and positioning of the exhaust. Here you can see how the footpeg bracket is pushed outward by the exhaust, and visualize how the design will also impede ankle movement. Above that, outlined in red, is the seat/tank juncture protuberance that’s uncomfortable and seemingly unnecessarily. MV is sometimes a victim of its form over function creations. Another ergonomic complaint is a seat/tank juncture that features a sharp protrusion right where your inner thighs come in contact with the bike when in a relaxed riding position. I got used to it by day’s end, but it really is an uncomfortable feature that shouldn’t exist on a premium bike from the likes of MV Agusta. Otherwise, the rider triangle is quite comfortable with plenty of legroom and a short reach to the wide one-piece handlebars. The seat retains a rather thin, hard cushion, but this is often subjective and differs for riders who spend more time on the street vs those who enjoy spinning track day laps. The $18,498 MV Agusta Brutale 800 RR is intoxicatingly alluring; a motorcycle you’ll make an unwarranted trip to the garage just to ogle its beauty and fantasize about next weekend’s ride. But it lacks technology such as cornering ABS and cornering TC as well as the aforementioned color TFT display – technologies that are hard to overlook on a motorcycle billed as exalted among nakeds. Saving the money and going with the new $16,350 2018 Triumph Speed Triple RS or the more closely related and even less expensive Street Triple RS ($12,500) can be a tough decision to make. Or, for frugal motorcyclists, pocket a few dollars more and go with a Twin, the $7,599 2018 Yamaha MT-07 Ryan Adams recently ran through a Spanish car wash. When it comes to what compels a person to buy an MV Agusta, former MO chief editor Kevin Duke wrote it best in his 800cc Euro Triples Streetfighter Faceoff, “The MV earns its greatest kudos when it’s time to park down at the Burger Barn. Style-wise, its attention to detail is superb, making MV’s ‘Motorcycle Art’ motto more than just the empty words from a PR flack. It boasts alluring elements no matter where you look, whether it’s the steel-trellis/aluminum hybrid frame, the magical open space below the seat, the single-sided swingarm, or the triple-exit exhaust.” Nuff said! Torque 87 Nm @ 10.100 r.p.m.